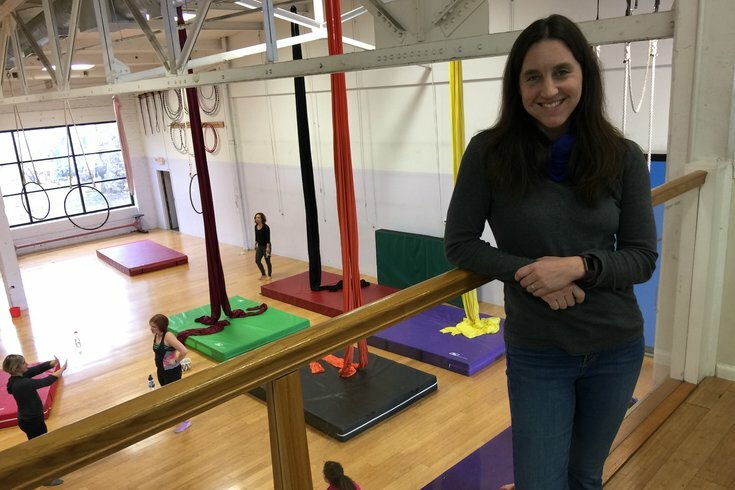 Shana Kennedy, executive director at the Philadelphia School of Circus Arts in Germantown, thinks the circus arts will survive (and thrive after) the loss of the Ringling Bros. and Barnum & Bailey Circus in May. When officials with the Ringling Bros. and Barnum & Bailey Circus announced that “The Greatest Show on Earth” would close its 146-year run in May, it marked the near-end of an American tradition. That includes Shana Kennedy, executive director of the Philadelphia School of Circus Arts in Germantown. She’s also at the helm of Circadium, a full-time, three-year professional training school for circus artists which, when it opens this fall, will be the first of its kind in the United States. “Circus is more alive in this country than it has ever been. But it is alive in a way that involves intimate, human performances," she wrote in a letter to the circus community. "Circus arts have always been transcendental to watch. As a circus class for adults was taking place at the Greene Street school, Kennedy expanded on how some good could come from something that she and her peers considered bad news. “Their closing has an impact on all of us more emotionally than anything else. It’s the idea that this legend that’s grown for so long is now coming to an end,” she said, citing last year’s closure of the Big Apple Circus as an omen that Ringling Bros. would follow suit. She said that in other countries, smaller traditional circuses have lived on while contemporary circuses – the variety without animals, performed in places like theaters where “human acrobatics tell a story and communicate something artistically” – continue to grow in the United States. The popularity of Cirque du Soliel and similar performances has helped with that transition, but smaller companies haven’t had the ability to yet grow akin to a theater scene with venues both large and small. “Contemporary circus has an artistic purpose. It is trying to do more that just say, ‘Wow, look at this amazing skill,’” she said. “Traditional circus is much more about displaying the skill as beautifully as possible. It’s the roots of where circus comes from: Look at this amazing trick. Kennedy said she’s spoken to the Fringe Arts Festival, as well. That’s a big change from when she got to town in the mid-1990s and people thought circus education was weird and dangerous. "As a country, we have to be ready to accept circus as something else," she continued. "That's going to take some time; it's not going to happen overnight for people to stop associating circus with elephants. But, it's happened in Europe, it's happened in Canada and it can happen here. "People shouldn't see the closing of Ringling as the closing of circus, but as the changing of circus."